Watermelon at a cookout? How about a watermelon shaped cake? I was invited to a birthday cookout and thought it might be more fun to bring a watermelon cake than a real watermelon. I had never heard of a watermelon shaped cake before, but ran gleefully to the kitchen armed with a 2 1/2 quart pyrex bowl as my "cake pan" and a recipe for red velvet cake, ready to take on the challenge. It worked well despite a few mistakes: I didn't anticipate how much longer it would take to bake a cake in a pyrex bowl than in a regular cake pan (about twice as long). There were a few mishaps I had measuring the ingredients (oops . . . that extra butter was for the frosting, not the cake). A basic vanilla buttercream builds the white "rind," and green fondant forms the outer rind. It was delicious! 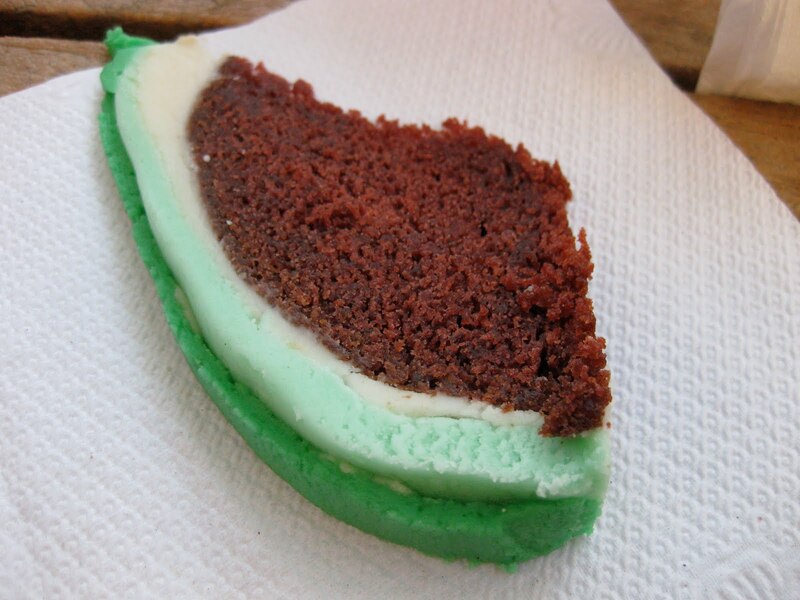 Half slice of the watermelon birthday cake. If you want to make your own watermelon cake, it's simple: Use a 2.5 quart pyrex bowl to hold the batter from a red velvet cake mix (check closely while baking...it will take longer than normal). Use a white frosting topped with a green frosting or green fondant to form the rind. If you don't care for red velvet cake, you can use a yellow or white cake and a little bit of red food dye. Voila! Watermelon cake. I'd change a few things in a future iteration: I'd make the cake a deeper red or lighter pink, use a bowl with a more pronounced cake dome, and make a smoother fondant rind. It would help to marble the light green and dark green fondants prior to applying it to the cake, rather than layering them like I did. These changes would yield a more polished watermelon shaped cake. Chocolate chip "seeds" might add a nice touch, too; I'm just not sure whether they would remain suspended in the watermelon cake batter or all sink to the bottom. Let me know if you make a watermelon shaped cake! I'd love to hear about it!